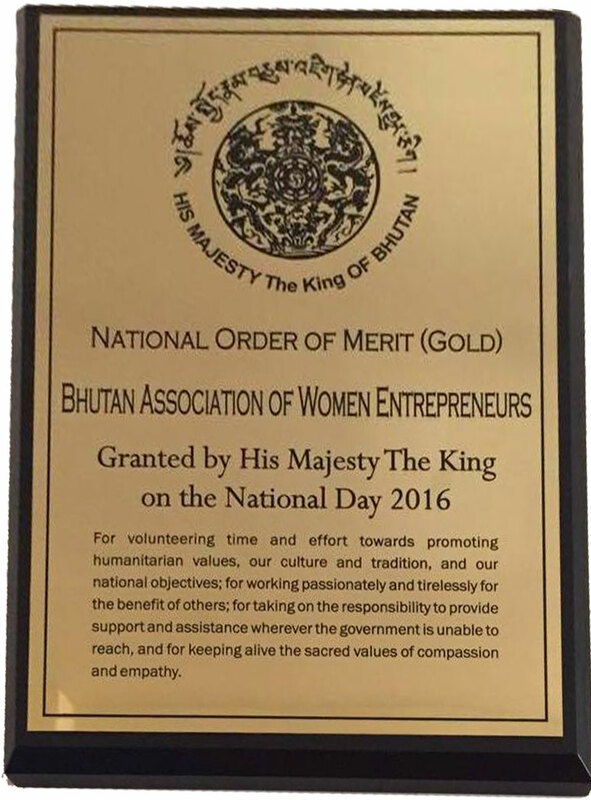 Bhutan Association of Women Entrepreneurs (BAOWE) is a legally registered non-government organization. It came to existence on 15th April 2010 under CSO Act of Bhutan, 2007. BAOWE stands for a just and equitable society in which women recognize their strengths and become successful, empowered entrepreneurs leading meaningful lives as responsible and responsive citizens of Bhutan. BAOWE will work to develop a social-consciousness-driven private sector and promote women entrepreneurs at the grassroots level thereby contributing to poverty reduction, self-reliance, and business from a GNH perspective to achieve the economic empowerment of women. BAOWE will provide a common platform through which the needs, concerns and aspirations of women entrepreneurs are collectively and effectively advocated, voiced and addressed by facilitating meaningful dialogues with relevant stakeholders, key partners and business community in general. A group of women professionals form a variety of backgrounds and specializations make up the Advisory Committee. This Committee consult from time to time to seek their technical advise, guidance and support in their areas of specialization. Such a forum is being set up for a two way communication and exchange of ideas, views and knowledge so that policy and practice can inform each other more effectively, particularly to take care of rural and women entrepreneurs’ perspectives. In addition to informing the policy making process, it also gives women professionals the opportunity to experience a sense of satisfaction of having helped and supported the less privileged women entrepreneurs of Bhutan with their knowledge and skills. The Head Office of BAOWE is located in New YDF Building, Phendey Lam, Thimphu. It will be operated under the leadership of the CEO who also participates in the BAOWE Board as its Member. The CEO will have 3-4 broad programmes with respective Programme Officers, whilst cross cutting service Units for viz. administration, finance, IT, M&E etc. will be attached directly to the CEO’s office. Introduction and implementation of BAOWE _Pelzhing ( Micro Finance Institution ) Program at Bongo Gewog under Chukha Dzongkhag. Which areas of business interest you? What enterprise are you planning to initiate? What support do you need or foresee in setting up your business?